Hotel Madhuram Royale impresses guests with its serene and prestigious location in the vibrant city of Jodhpur. The hotel�s spectacular exteriors and brilliant interiors produce a stunning and enthralled reaction. The graceful and deeply relaxing accommodation offers hospitality that is worthy of adulation, all set in elegantly designed rooms exuding a polite grace with a flexible check-in and check-out. 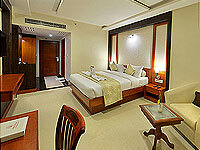 The stylish rooms, the eclectic multi-cuisine restaurant tantalizes you with a sheer delight. A wide range of thoughtful and innovative wellness initiatives rejuvenates the elongated stay. 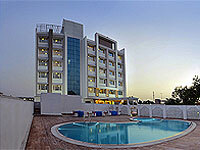 It is a perfect blend of elegant architecture and contemporary facilities. An ecstasy of luxury and comfort, the hotel assists you in planning a perfect wedding event with all the assistance of a grand wedding arrangement. Phone services with ISD, STD.